“Unlearning the City: Infrastructure in a New Optical Field” was publisehd in 2012. Swati Chattopadhyay co-edited “City Halls and Civic Materialism: Towards a Global History of Urban Public Space” with UCSB architectural historian Jeremy White. As an architect who shifted career paths and sought to study buildings and spaces rather than design them, Swati Chattopadhyay looks at architecture in a broader, historical context, challenging ideas about buildings and cities as seen through a Western lens. 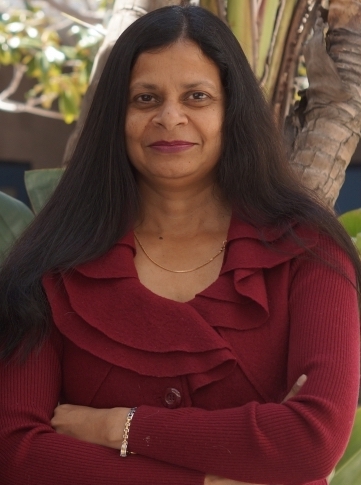 Studying cities, everyday spaces and the cultural and historical factors that produce the built environment are essential for understanding social relations in terms of class, gender, racism and politics, says Chattopadhyay, a professor in the Department of History of Art and Architecture, and in the Comparative Literature Program, at UC Santa Barbara. That deeper examination of architecture led the Society of Architectural Historians to name Chattopadhyay to its 2018 class of fellows, recognized for a “lifetime of significant contributions to the field of architectural history,” including scholarship, service to the society or “stewardship of the built environment.” One of four individuals so honored, Chattopadhyay will be inducted at the society’s 71st Annual International Conference awards ceremony on April 20 in St. Paul, Minnesota. Chattopadhyay came to UCSB 20 years ago, having earned a master’s in architecture from the University of Arizona and a Ph.D. from UC Berkeley. After completing her Bachelor of Architecture degree at Jadavpur University in Calcutta, India, she had worked as an architect in New Delhi, where she designed educational institutions and public buildings. She turned from architectural practice to academia because she wanted to learn more about the social and historical aspects of design. “My interdisciplinary strengths as a scholar rest on the fact that I came out of a technologically inflected undergraduate professional education in architecture and then made a transition to the humanities and arts,” Chattopadhyay said. Chattopadhyay specializes in the ties between colonialism and modernism and has written widely about modern architecture and urbanism, infrastructure, popular culture, art and architecture of empire, and the cultural landscape of British colonialism. Drawing from her Indian roots and interest in history, particularly of colonial India, Chattopadhyay hopes her work will encourage others to perceive their everyday landscapes differently. “We often fail to see the obvious,” she said. “For instance, why is Calcutta so well-known for its poverty but not its incredible collection of beautiful Art Deco buildings? Why do planners and urbanists routinely ignore the creative strength of popular culture in South Asian cities? Chattopadhyay is the recipient of numerous honors and awards, including Guggenheim and J. Paul Getty fellowships, a fellowship from the Swedish Collegium for Advanced Study and a Distinguished Visiting Fellowship from Queen Mary, University of London. She has received grants from the National Science Foundation and the American Institute of Indian Studies as well as the Society of Architectural Historians’ Founder’s Award. Currently, Chattopadhyay is writing two new books. “A Geography of Small Spaces” focuses on the small scale to rethink empire as a global enterprise. It is a story of unexpected connections in and through small spaces: verandahs, terraces, storage spaces, kitchens and bookshelves. The second, “Nature’s Infrastructure: British Empire and the Making of the Gangetic Plains, 1760-1880,” is a spatial history that examines the Ganges River system and human impact on the river, focusing on the canals, bridges, dams, towns, administrative infrastructure and political campaigns built around this river that was the heart of the British colonial empire. Chattopadhyay’s future projects include a study of colonial landscapes and gardens in South Asia, and the Calcutta/Kolkata Co-Lab, a collaborative effort by Chattopadhyay and others to launch a web-based project of architectural documentation, historical analysis and stories about Calcutta’s buildings and cityscape.